For assignment two, we were all divided into groups, mixing students from different design specialisms ( Textiles, Jewellery and Metal Work and Interior and Environmental Design). I think this was a really good idea because it gave each of us a chance to get to know other students out with our own design classes and also gave us each an insight to how another specialism approaches a similar project. Our set brief for this assignment is called “Something For Everyone”. In this brief, we had to find a way of easing the isolation and lonliness of older people. Using a service, environment or product, we would unite them with the younger generation by finding shared hobbies, interests, needs etc. For our research, we decided to create three brainstorms using techniques from previous Change By Design workshops. 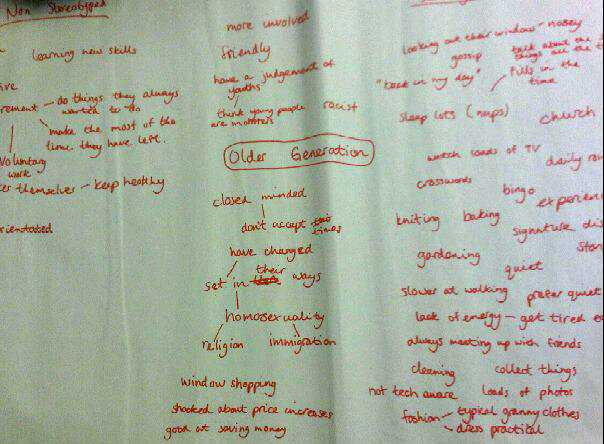 Our first brainstorm was on the ‘younger generation’ . 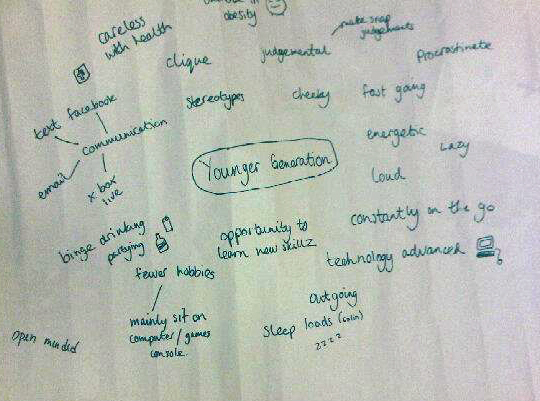 This brainstorm consisted of the younger generation and their traits, general personalities, interests, habits etc. For example, the younger generation are quite loud, more outgoing, energetic/lazy, mainly communicate with the likes of Facebook, text messaging, Instant messaging and email as opposed to face to face communication (shown more through the older generation). 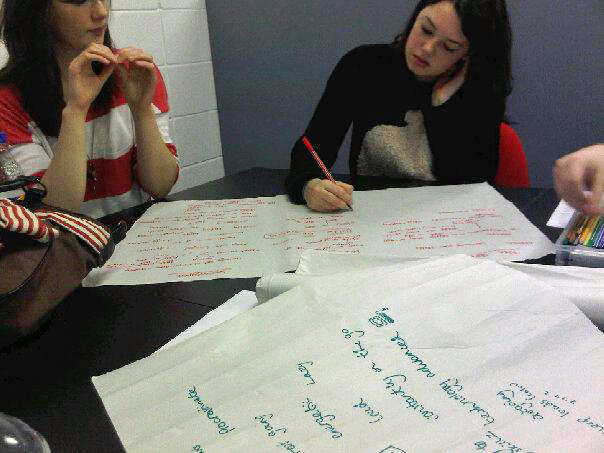 This brainstorm consisted of the ideas raised in both the younger and older generation brainstorms. This was when we started to combine both generations and link their interests etc. This was a way of thinking about how to unite them. After this brainstorming session, we each gave ourselves ‘homework’ which was to come up with an idea that could unite both generations though an environment or product. I came up with idea based on an environment that could be shared by both generations much more freely and more comfortable to whatever age group. This environment is the Cinema. The Cinema already has a very mixed age group and that is one of the reasons to why I couldn’t get as much ideas on ways that I could unite both generations together. 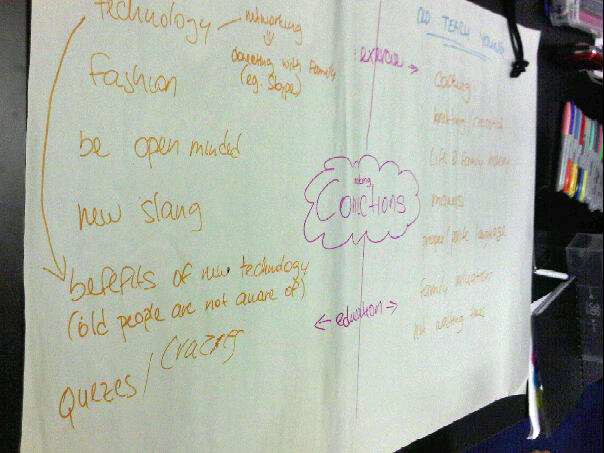 However, the main idea behind this brainstorm was to think of ideas to make the cinema more accessible to both the younger and older generation without making either feel uncomfortable with their surroundings. Ideas like healthier food, tea, coffee etc as opposed to hotdogs, fizzy drinks, chocolate that are less appealing to the older generation. In our next meeting, we all discussed what we all came up with for our homework task. 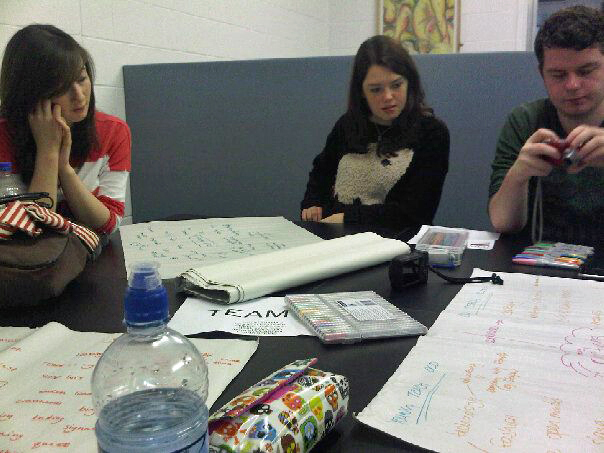 When we finally decided on our winning idea, we made our final brainstorm! This was our final brainstorm that combined all the ideas from our previous brainstorms and a developed/final idea of a way that could unite both the younger and older generations. There were certain ideas that could not like either groups together due to perhaps the intensity, lifestyle ( like extreme sports for example) but we each took everyone’s ideas into account and discussed key for our final idea. This came from ideas from each member of our team.We had discussed ways in which both the younger generation could unite with each other such as my cinema idea, demonstrations – baking, knitting, technology classes. One of the ideas that got developed was the idea of a “coffee shop”. This idea was suggested from our team-mate Jana. I feel that it’s a great idea and a great way to combine two of the given generations. 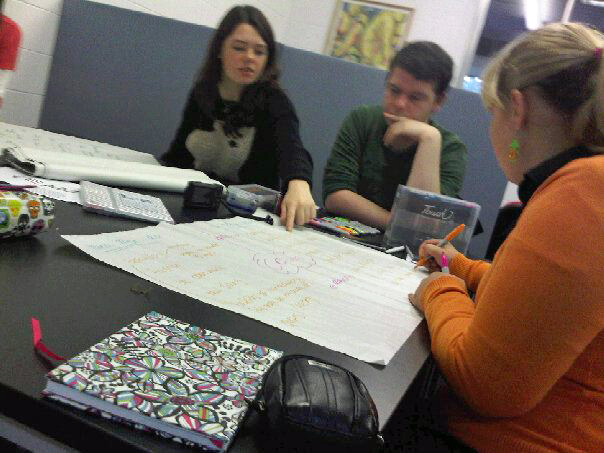 The “Coffee Shop” idea was the basis to our final brainstorm and idea that could unite the generations. When we spoke about the coffee shop and all the things that we could do to unite the younger and older generations such as active learning – baking, knitting, book readings etc, we discussed that a coffee shop is not the idea environment for some activities as it may be too loud or distracting to other customers. It was from this that we thought of the idea of a community centre. However, to a young person, ” community centre” does not sound very appealing or “cool” therefore, we decided that it would need a new name to attract younger people. 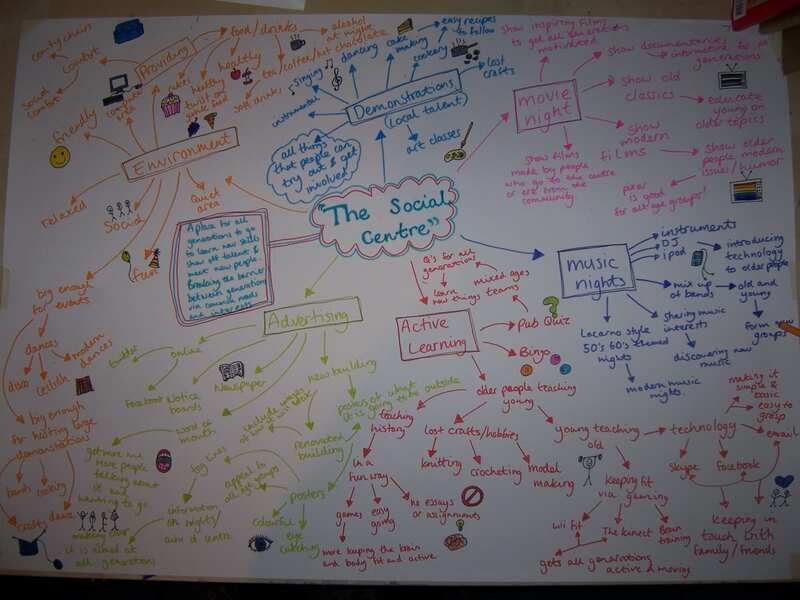 ” The Social Centre” was then created. “The Social Centre” would purely be relied on volunteers from different age groups to demonstrate their skills, interests, knowledge and engage with the other generation. For example, the old generation teaching the younger generation about cooking and the younger generation teaching the older generation about technology. I really liked this idea and after really thinking about it, I feel it could work because everyone, no matter what age group you are from, are always willing to learn something new whether it be for work purposes or just leisure. It would be a free learning environment with elements of fun to attract the younger age groups. We discussed everything from how the activities could combine both age groups to the atmosphere and environment of the centre itself. Overall, I feel we all worked very well as a group as we all raised great ideas, listened to one another, shared ideas and took into consideration the ideas of each other. Furthermore, I think we also did very well considering we were all mixed from our specialisms and we didn’t really know each other. I feel we made very valid points and came up with a great final idea! This image was in our first brainstorming workshop! 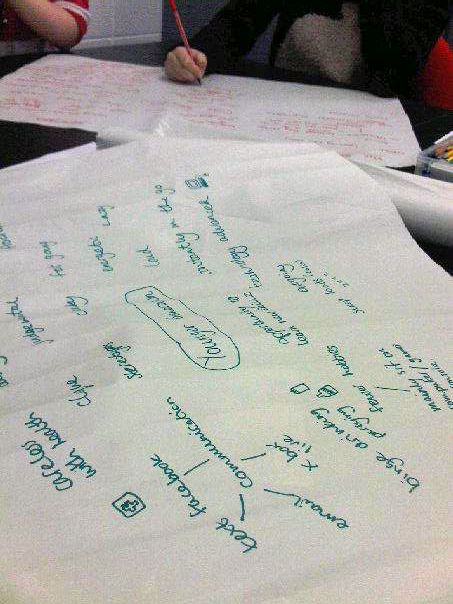 This particular brainstorm was in the style of post it notes (as you can see!). This style was very fast paced but I found that there was a lack of communication in this method as everyone wrote down their own ideas and didn’t really share ideas as much as we could have in our brainstorming session. Also, ideas were often repeated as no one shared ideas thus, people had several relating ideas. Our first technique for brainstorming was the technique used for our final brainstorm. This technique is very effective as everyone in the team communicates very well, sharing ideas, saying their own thoughts etc. I found this technique to be more of a winner when it comes to brainstorming as I feel that I could really get a lot of key information through this as mainly everything was shown in quick, key points. A method I will use throughout my studies ( and career hopefully!). I found brainstorming quite an effect method and it is one that I will probably make a lot of use of during my studies!